The object of the game was simple. I was to take the empty bottle of wine back to the café down the block and ask them to refill it, or else exchange it for a full one. I was to buy a package of salt, whatever kind it was they served on our salad last week when M and I had lunch there. Before I left the apartment, I asked M, seated at his computer, “How do I say sea salt in German? And how do I ask for a refill?” He just shrugged and shook his head. I had forgotten to look up the words in the dictionary before putting on my coat. “Never mind,” I said, heading out the door. It’s best not to overthink every errand, I reminded myself, no need to beat myself up for not getting the words right, because shopping here remains a game of back and forth, give and take, German and English. And this time it would bring French into play. But somehow, no matter the language or how badly we speak it, we keep managing to bring home the groceries. I headed out into the new sunshine and down the block. We’d been walking past this place for months without entering. L’épicerie, it’s called, and they list quiches on their chalkboard of daily specials. M and I had intended to go to our favorite Habibi for falafel one day the week before, and get a coffee elsewhere afterwards, but we slowed to a stop before the slate of reasonably priced quiches propped outside the door, and realized we could save time by ordering both our meal and our coffee in one fell swoop. 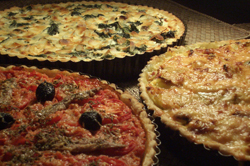 The quiche turned out to be magnifique, and M became smitten with the large grains of salt they served on their salad. By the time we left we added a bottle of house wine to our lunch bill to take home for later. The server handed us a bottle with a small cork in it; clearly he’d just filled it from some vat in the back. This time I returned to the café with the empty bottle in my purse. The deposit on the bottle was a euro, and I hoped to get a refill and some of that special salt. As I entered I saw a lone man sitting at a table who looked a bit antsy, craning his neck to see if anyone was likely to emerge from the kitchen anytime soon. He seemed to be gripping his menu a little too hard. I wandered past him to the small room in the back where a few French groceries were assembled on the shelves. I found a shelf of salts and picked each one up and shook it to see if it sounded like large-grain salt. I was killing time, waiting for the server to emerge too. A man came in to make a delivery with a few boxes, and upon his arrival, the young man who had served M and I last week came out to take the groceries off his hands. The two of them exchanged some pleasantries in French. The supplies safely delivered, the young man then went to take the anxious patron’s order. Then it was my turn. “Guten tag,” I opened, feeling as if I were tossing the lowest card in my hand on the counter between us. Two of spades; my opening in German implied I had more cards in this suit, but the truth is there were slim pickings. The waiter responded by asking what I’d like in German, and though I understood him I felt that same dread that I feel all too often in Berlin; I knew I could start my sentence with “Ich hätte gerne,” the politest form of “I would like,” but beyond that I was plumb out of words. The waiter surely saw the look on my face: the understanding without the vocabulary to respond. It hit me that I had majored in French, and everyone here seemed to speak it; I could still piece together complete sentences in that language. “Lequel sel utilisez-vous sur votre salade?” I asked, holding up two different boxes, grinning inwardly. Lequel! I hadn’t used that word in a long time. He hemmed and hawed in French and then said he thought it was the one in my left hand. I put the box he had indicated on the counter. “Et encore une bouteille de vin, s’il vous plait?” I asked, now pulling the empty bottle from my purse. I was having fun now. French! Why hadn’t it occurred to me to come here sooner? Here’s a little oasis from German, I thought, a place where I can use the language I once spent years studying. “Un moment,” he said, and took the empty bottle from me and carried it back to the kitchen to confer with whoever was back there. He came back from the kitchen empty-handed and told me that he was désolé, but they were out of their house wine. Not a problem; I’ll choose one from the shelf, I said in French, though I sensed that several errors had crept into my sentences, and I worried I’d overplayed my hand. I chose a different wine off the shelf, one that looked familiar, and put it on the counter next to my box of sea salt. “That’s twelve euros, please,” he said in English, shifting gears entirely. Now that was unfair. What happened to French? Discarded so quickly? I was trying, really I was, and I had more words to offer in French, a decent vocabulary to draw from, and given half a chance can hold my own in it, but he rejected my efforts when he upped the ante to English. I was annoyed at first, until I realized that his English was thick with a French accent, and though he was perfectly understandable, English was, after all, my strong suit, not his. But I may as well have parted with a more final Adieu, since the tension of switching languages every few sentences made me dizzy. I have no interest in playing that game too often. Two languages is bad enough. Three in play is just too many. It struck me that the game of testing one another to see if we were on equal ground in a given language, then changing suits to the next when it appeared one of us was hopelessly outclassed, then yet again until we landed on the ubiquitous, common English, exhausted me, though it worked to my advantage. This entry was posted in City life and tagged Berlin, cards, English, French, German, L'épicerie, sea salt on March 10, 2014 by Jill M..
Jill, this exchange made me laugh out loud. I could have never managed it! Ha! Please tell C. that I. is missing her terribly. She has made a lot of new friends at Ramsey this year, but every time I’m listening in the background, I hear her telling her new friends about C. and about how much they’re going to like her. I loved this! Reminds me of being in Poland mentally exhausted all of the time, and still sounding no more articulate than my three year old cousins. In your piece I didn’t see the flip over to English coming….very funny! Being without the local language is like being a child again, isn’t it? Glad you found it funny. I was surprised myself and wanted to try to capture that. I could have never managed it!